minor roles played by: Vida Taylor, Patricia Pearse, William Wynn, Doug Stortenbecker. 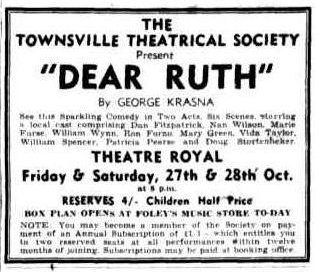 Townsville Theatrical Society presented George Krasna'a comedy of modern American life, 'Dear Ruth' to a packed and enthusiastic house in the Theatre Royal. The play has had considerable success overseas, and ran for over a year on Broadway. It is a comedy of character as well as of situation but several of last night’s cast, with the particular exceptions of Ron Forno and Mary Green, seemed content to rely on the situation for laughs. All, however, did give definite interpretations. The presentation as a whole is quite sparkling and often very amusing. Dialogue, in places tend to the risque and is pleasantly subtle. Direction could have been firmer, and some of the diction clearer. Mary Green, a newcomer to the Townsville stage, plays Miriam Wilkins, the cause of all the trouble. Ron Forno appears as Albert Kummer, and other members of the Wilkins family are portrayed by Nan Wilson, Marie Furse, and Dan Fitzpatrick. William Spencer is the soldier, and smaller parts were filled by Vida Taylor and Patricia Pearse, William Wynn and Doug. Stortenbecker. Selling is excellent and costumes, particularly the women's, very effective. 'Dear Ruth' will be presented at the Theatre Royal again to-night. The Theatrical Society is to be complimented on its consistent presentations to Townsville of good plays and upon the benefit it consequently confers upon the community. Its productions are ambitious and of a standard high enough to be eagerly awaited.